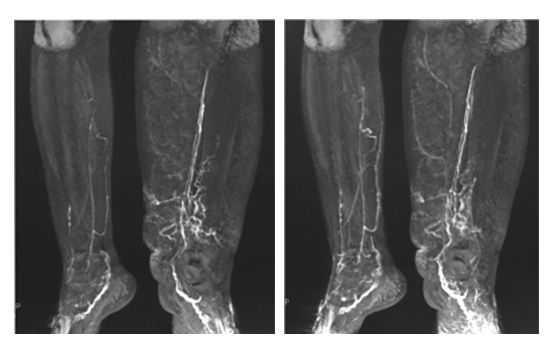 Magnetic resonance lymphangiography (MRL) is an essential imaging examination for the planning of microsurgical lymphatic vessel reconstruction, a procedure to treat lymphedema. Its importance to surgical planning and the technique used by radiologists in Italy are described in an article published in BioMed Research International. Lymphedema, the excessive accumulation of lymphatic fluid in the interstitial tissue, results from impaired lymphatic transport caused by damage to lymphatic vessels, infection, or congenital abnormality. The current preferred treatment is lymphaticovenous anastomosis (LVA), whereby collected lymphatic vessels are anastomosed to a cutaneous vein under surgical microscopy. MRL can provide more accurate functional and anatomical information due to its better spatial and temporal resolution, according to lead author Francesco Giuseppe Mazzei, MD, a radiologist at the Azienda Ospedaliera Universitaria Senese in Siena. The authors explain that the procedure enables the examination of lower or upper extremities in several steps that provide high spatial and temporal resolution. Dynamic information of contrast agent uptake of both lymph nodes and lymphatic vessels can be obtained. MRL depicts the drainage patterns, lymph node positions, lymphatics, venous structures and the severity of the lymphedema. All this information enables surgeons to plan the best strategy for microsurgical lymphatic vessel reconstruction. Following surgery, MRL can be useful to evaluate changes in the lymphatic circulation or in the event of possible super-microsurgical treatment complications. The authors reported that the examination time for the procedure typically takes 50 minutes for an arm and 1 hour 15 minutes for a leg. These were the average procedure times in a study of 30 lymphedema patients who had a MRL examination over a 30 month period that started in February 2014. A 1.5 Tesla MR unit was equipped with an 8-channel body array coil for the imaging of upper extremities and a phased-array peripheral vascular coil for lower extremities to provide large anatomical coverage and a good signal-to-noise ratio. MRL in a 40-year-old woman with congenital primary lymphedema of the lower left limb depicts pathological lymphatic vessels superimposed to veins. The imaging protocol typically utilized consists of a heavily T2-weighted sequence to evaluate the extent and distribution of the lymphedema and a 3D fast spoiled gradient-echo T1-weighted sequence with a fat-saturation technique for lymphatic visualization. Instead of a heavily T2-weighted sequence, the authors performed a 3D steady-state free precession (SSFP) balanced electrocardiography (ECG)-triggered sequence with spectral fat saturation to obtain a good visualization of both the venous system and the distribution of the lymphedema within the same sequence and at the same time. A precontrast coronal 3D spoiled gradient-recalled echo T1-weighted sequence with SPECtral inversion at lipid in all stations in order to increase contrast sensitivity. Post-contrast imaging of the first station repeated 5, 20 and 35 minutes after injection of the contrast medium, followed by imaging of the other stations, each at the same fixed time interval. The authors used multi-planar reformations (MPR), thin-section maximum intensity projection (MIP) reconstructions, and a 3D pointer to identify and localize the different lymphatic and vascular structures. They created a long-extremity display combining all (2-4) of the anatomical sections imaged. They also emphasized the importance of performing a precontrast sequence to subtract these from postcontrast images, thus facilitating a better visualization of small lymphatic vessels. The lymphedema shows as an epifascial distribution with high-signal intensity in coronal 3D SSFP-balanced images. Pathological lymphatic vessels are recognized by a tortuous and beaded appearance, with the mean maximum diameter of affected lymphatic vessels similar to that of adjacent veins. Dermal backflow and honeycombing, visible after a mean time of 15-20 minutes following contrast media injection, are other characteristics of lymphatics. The kinetic of the enhancement can help to differentiate lymphatics from adjacent veins. While veins wash-out occurs in later sequences 5-10 minutes from contrast agent injection, affected lymphatic vessels remain enhanced. In their article, the authors describe in detail the content that the radiology report should contain. The article also contains photos showing the positioning of a patient, a table of imaging parameters to use at 1.5T, as well as diagnostic images. Limitations of MRL are the long duration of the MR examination. Radiologists may also have difficulty in distinguishing the affected lymphatic vessels when venous contamination is present. The contrast agent used is gadolinium. However, it is the authors’ opinion that “MRL with gadolinium represents the best current method for planning an optimal surgical treatment” and recommend greater use of this procedure. Mazzei FG, Gentili F, Guerrini S, et al. MR Lymphangiography: A Practical Guide to Perform It and a Brief Review of the Literature from a Technical Point of View. Biomed Res Int. 2017 Article ID 2598358. Using MR lymphangiography for lymphedema microsurgical planning. Appl Radiol.